Image is Vert-. 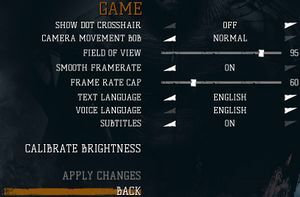 FOV needs to be increased to compensate in order to attain a correct Hor+ image. See the WSGF entry. Can be set between 70-100 ingame, for other values see Field of view (FOV). 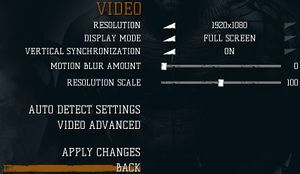 Disable frame rate cap in the options. Edit the following line to your desired value. 3. 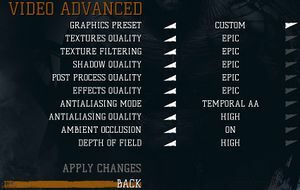 Next, open GameUserSettings.ini and edit the following line to the same value. See Helix Mod: Kholat (DX11). ↑ 1.0 1.1 File/folder structure within this directory reflects the path(s) listed for Windows and/or Steam game data (use Wine regedit to access Windows registry paths). Games with Steam Cloud support may store data in ~/.steam/steam/userdata/<user-id>/343710/ in addition to or instead of this directory. The app ID (343710) may differ in some cases. Treat backslashes as forward slashes. See the glossary page for details. This page was last edited on 14 December 2018, at 11:39.